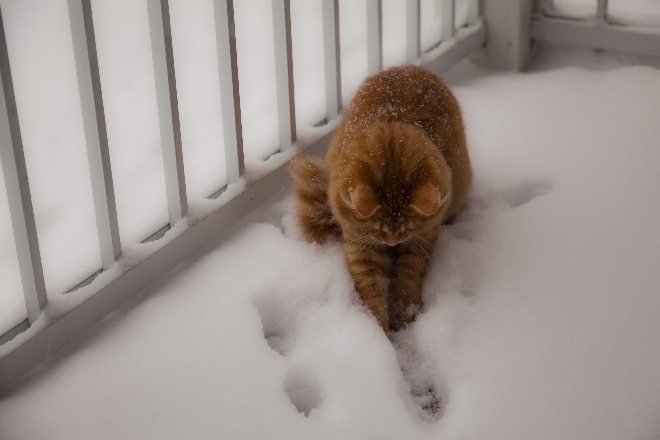 November 2011 – Downright balmy! 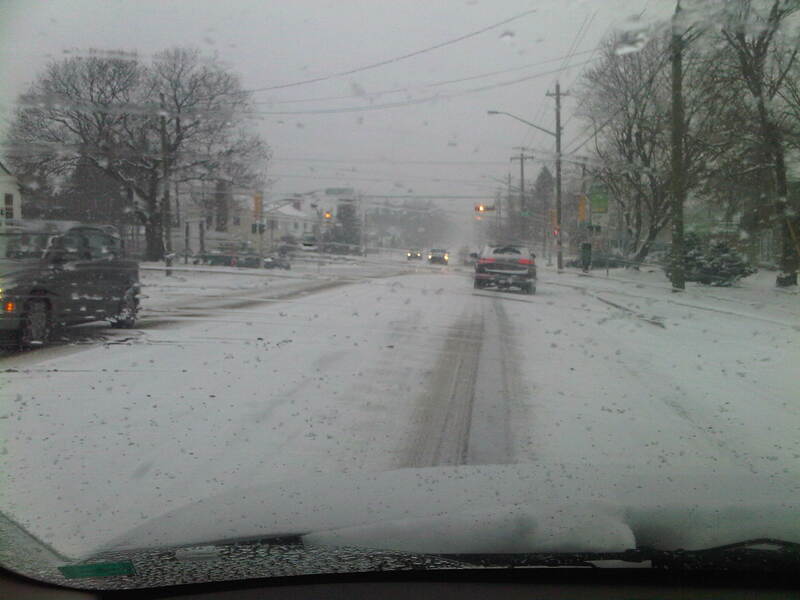 Greater Moncton had its mildest November in about five years and measurable snow didn’t occur until mid-month. 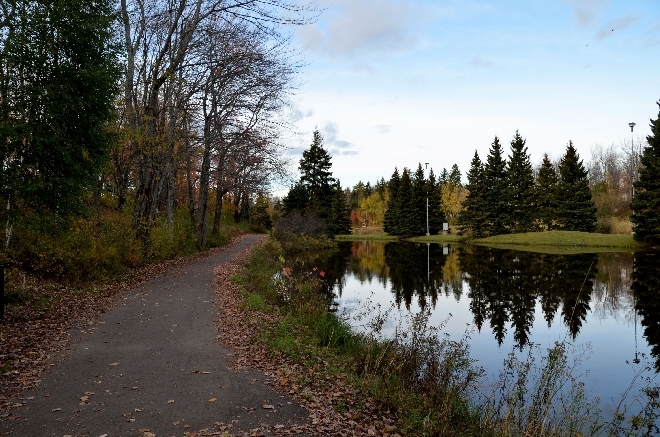 Environment Canada reports temperatures were at least three degrees Celsius above the 30-year average but precipitation was just about normal for the month. A major rainfall event occurred on Remembrance Day with almost 50 mm of rain. 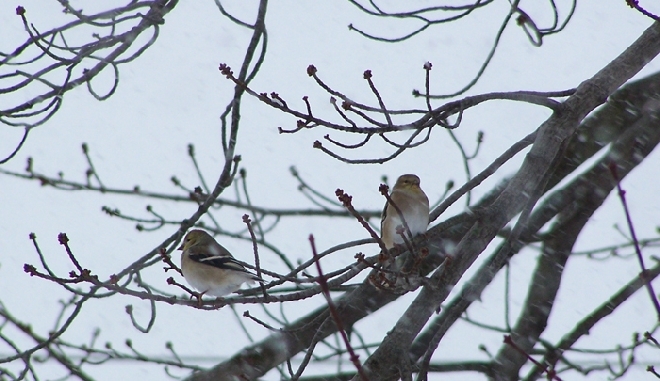 A major snowfall event happened on the 23rd with 21.6 cm recorded at the Greater Moncton Airport (although slightly higher amounts were reported elsewhere in the city) – which breaks a record from 1965. Snow does fall in the American South but rarely in November as it did yesterday and today. Snow fell in cities such as Nashville, Memphis and Jackson, Tennessee (where as much as 10 cm was reported) which seldom see more than a few flakes before December. 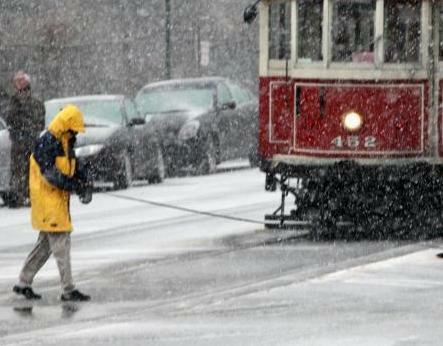 U.S. weather officials say the last time Nashville saw more than two centimetres of snow in November was in 1966. Tupelo, Mississippi has only seen three days with measurable snowfall in November since 1930. Schools closed in some areas after the snow created icy bridges and overpasses. The first significant snowfall of the season proved to be record-breaking in much of New Brunswick according to Environment Canada. Greater Moncton Airport recorded about 25 cm of snow which beats the old record of 22 cm from 23 November 1965. Saint John Airport saw 30 cm which eclipsed a record of 18 cm from 1956. Even more impressive snow totals were recorded in Nova Scotia – Halifax Int’l Airport 34 cm, Greenwood 37 cm and Sydney Airport 40 cm. The first snowfall of the season in Greater Moncton has reminded us that we often suffer from what is called the “Great Canadian Memory Loss”. It was slow going in the city today as drivers grappled with heavy snow and slick roadways. As with most first snowfalls, motorists forgot how to drive in the white stuff. RCMP reported numerous fender benders in Southeast New Brunswick, although none were serious. Much of New Brunswick is expecting its first taste of wintry weather tomorrow with a snowfall warning posted by Environment Canada and as much as 15 cm of snow on the way. Greater Moncton has been lucky so far with just a few flakes and a light dusting on the ground but that is about to change with a moist system from the south meeting cold air from the north. 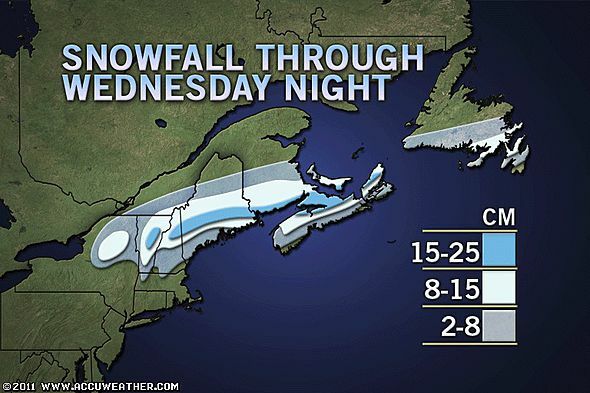 According to the above graphic, Moncton should expect 15 cm of snow with higher amounts along the Fundy coast and northern Nova Scotia. November does not typically bring beach-going weather in New Brunswick but today was one of those rare exceptions. 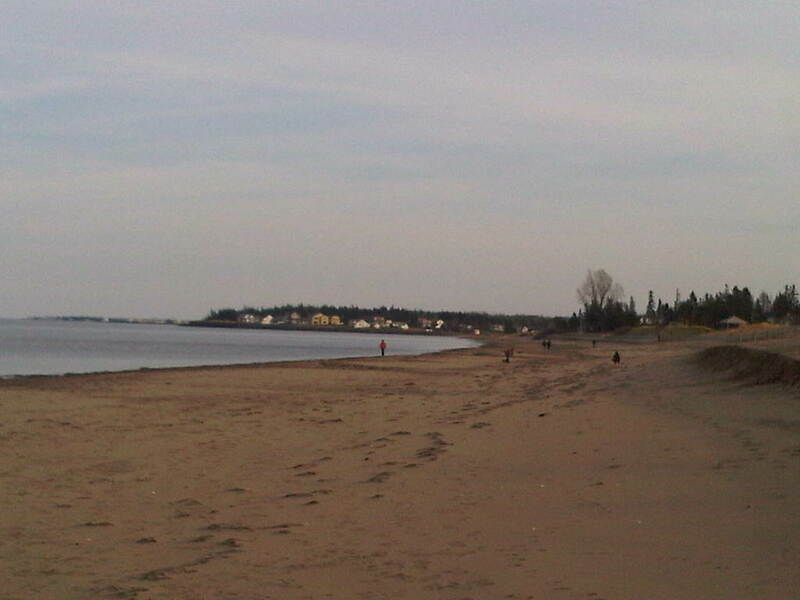 About 13 C with a calm wind and a blue sky meant for a great afternoon to walk along Parlee Beach – one of my favourite places in the province. Environment Canada says the long range outlook is looking good too with temperatures in the low to mid-teens Celsius for the next several days. Tropical Storm Sean packed a punch as it moved south of the Maritimes bringing strong, gusty winds and drenching rain – especially along the Atlantic coast. In Greater Moncton, almost 50 mm of rain fell yesterday which led to pooling water on many roadways and winds gusted as strong as 70 km/h. Winds were as powerful as 100 km/h in Nova Scotia and even stronger gusts were reported in the Cape Breton Highlands with numerous power outages. 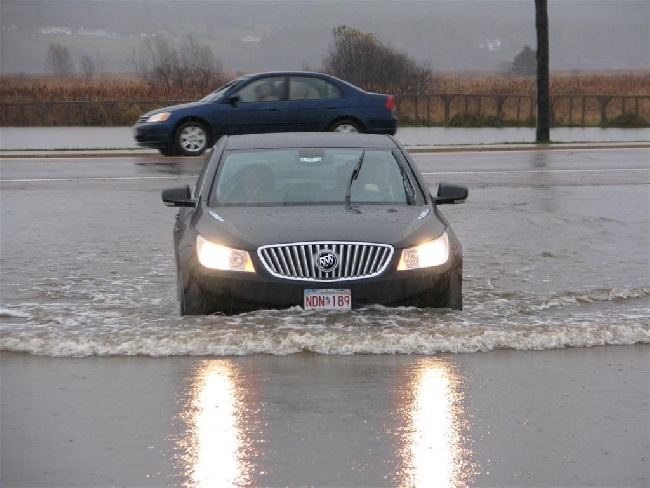 Saint John was soaked by almost 90 mm of rain while Halifax was drenched with more than 100 mm yesterday – which is more than a month’s worth in just one day. Rivers and streams swelled and flooding was reported in many areas of the region. Just when you thought the 2011 hurricane season was over (officially it ends on 30 November), along comes another storm. Tropical Storm Sean is churning SW of Bermuda and could become a hurricane by tomorrow. 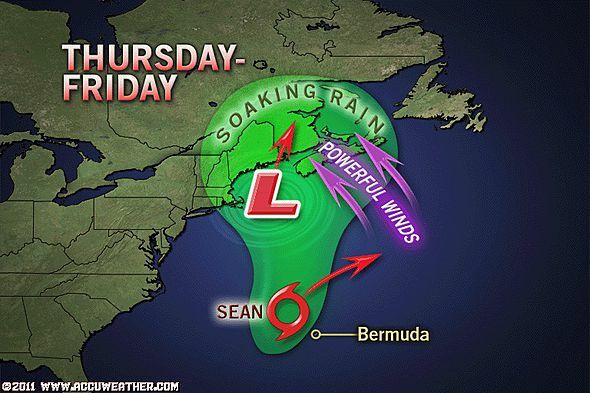 The Canadian Hurricane Centre is monitoring Sean as he moves north and officials say Atlantic Canada can expect high winds, heavy rain and unseasonably warm temperatures (up to 20 C) starting Thursday and into Friday. The growing season in Greater Moncton is officially over. The first hard frost of the season was recorded this morning when the temperature dropped to -2.8 C under a clear sky. Although a couple of light frosts have occurred since the end of September, they were scattered with only minor damage to plants reported.